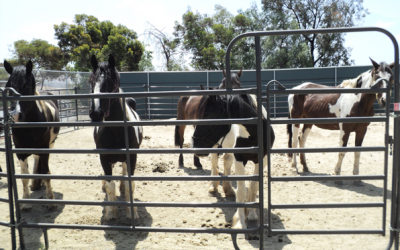 May 24, 2013 (Ramona)--The County Department of Animal Services (DAS) is investigating the death of a horse and is caring for another ten horses seized from an owner in Ramona late yesterday afternoon. DAS was called to Ramona Monday after a group of horses was found loose on Highway 78 Monday. CHP and CALFIRE returned them to a nearby property, and DAS began monitoring a herd of 30 horses at the location, noting that the animals lacked food and water. CALFIRE supplied some water, but the conditions prompted DAS to post a notice advising the horses’ owner the animals were subject to seizure. Concerned neighbors also provided some feed to the horses, but based on the conditions officers found during a check yesterday, DAS seized all of the animals on the property. After seizing the horses, the owner confirmed that another one of her horses had recently died. DAS is investigating the circumstances of that death. Seven mares and two foals are now being stabled at the DAS shelter in Bonita. 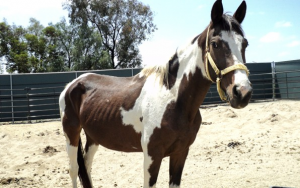 One stallion is under the care of the DAS shelter in Carlsbad. The horses’ hooves need to be trimmed but from outward appearances, the horses need minor care and none is in a life-threatening condition. A veterinarian checked on the horses upon their arrival yesterday and the results are still pending. The animals will remain under DAS care until further notice.